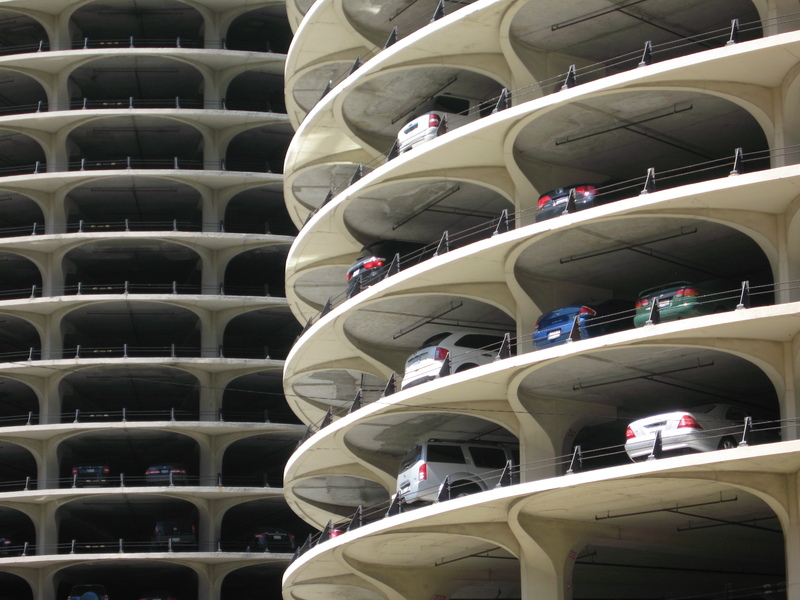 Bertrand Goldberg’s Chicago | ride. travel. live. 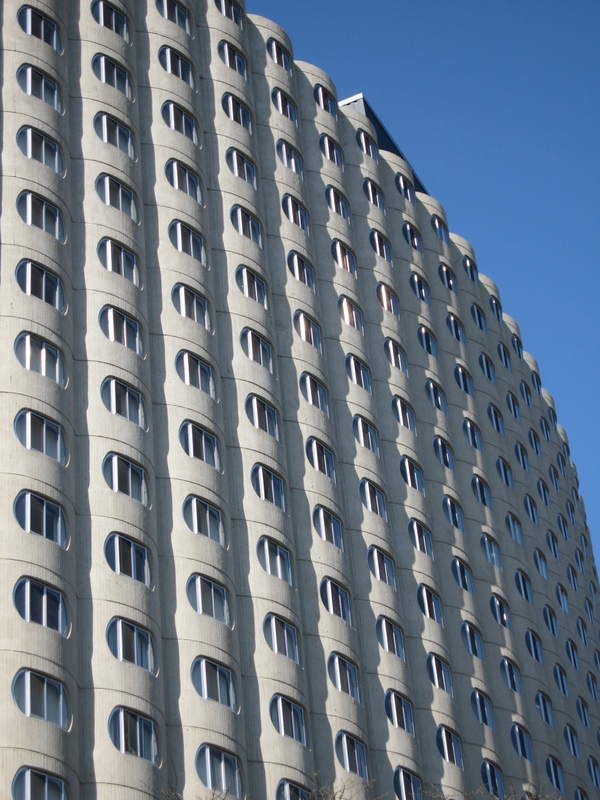 Mies gets the glory, but Bertrand Goldberg (1913-1997) left a distinctive personal mark on Chicago’s built environment. 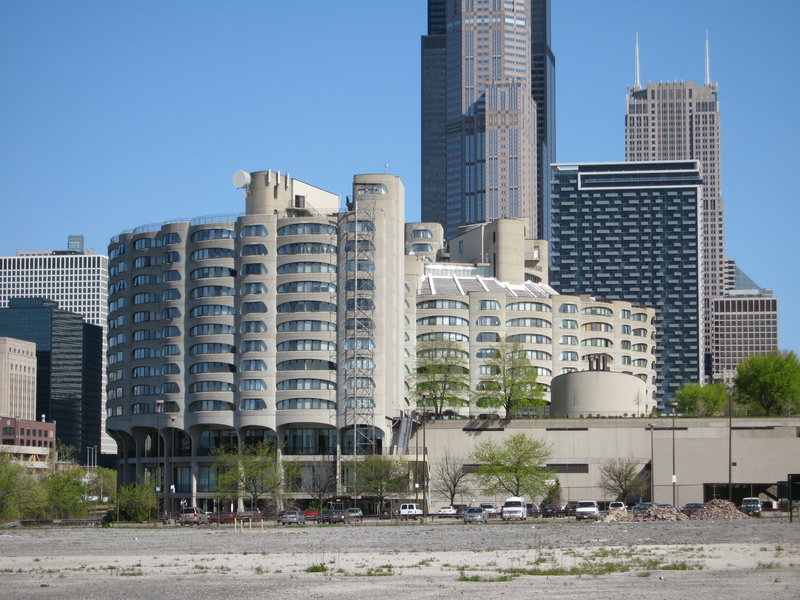 He is most famous for his Marina City complex downtown, but he also designed a number of other structures in the city during the course of his long career. His work after 1960 is easily recognized, with obviously organic forms, but his earlier work is harder to categorize. 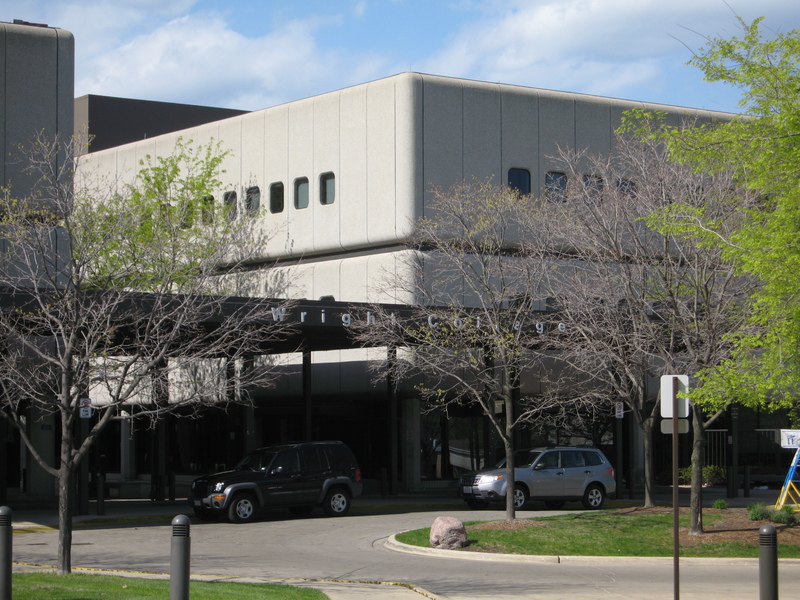 I took a driving tour of his buildings in Chicago (south to north), and here are some of my observations. 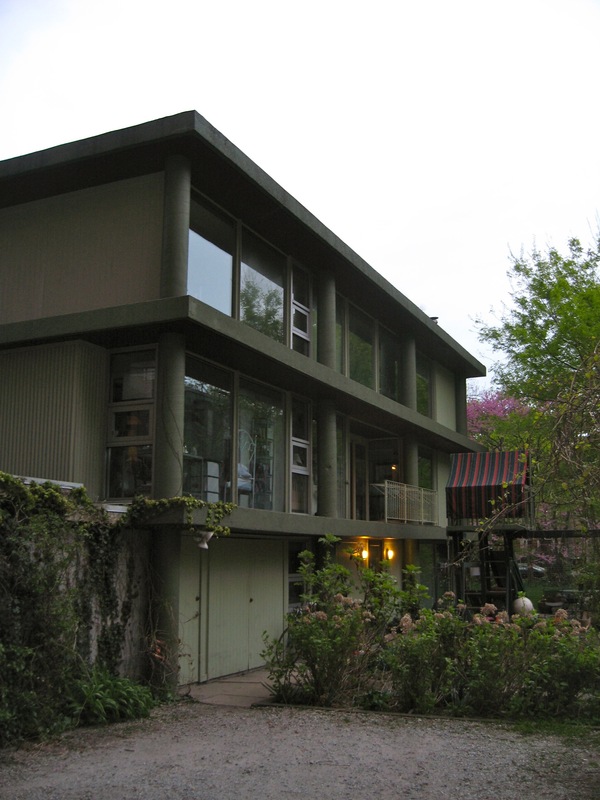 Helstein House, Hyde Park (1951): It’s very easy to miss, as the house is tucked away in the back of the lot, hidden behind a front yard and a tangle of greenery. Ostensibly, this was to enhance privacy and also to avoid offending the neighbors with its daring architecture. The best way to see it is from the parking lot behind it, where there’s a clear view of the house. He relies on concrete and glass, as is the case for all of his structures, round pillars and floor-to-ceiling glass. But there’s little hint of the curvaceous forms that would characterize his later work, starting with Marina City. The paint scheme is a puke green, appalling. Back side of Helstein House, the ground floor has apparently been modified. Drexel Homes, Kenwood (1955): Drive by, and you’ll easily miss it. Built as a large complex of townhouses along Drexel Boulevard, these houses are in varying states of repair, some are well-kept, others are in need of upkeep. The townhouses are on the western fringe of prestigious Kenwood (Obama’s neighborhood), and the houses themselves are simple, modular designs with economy in mind, although many have been modified over the years. 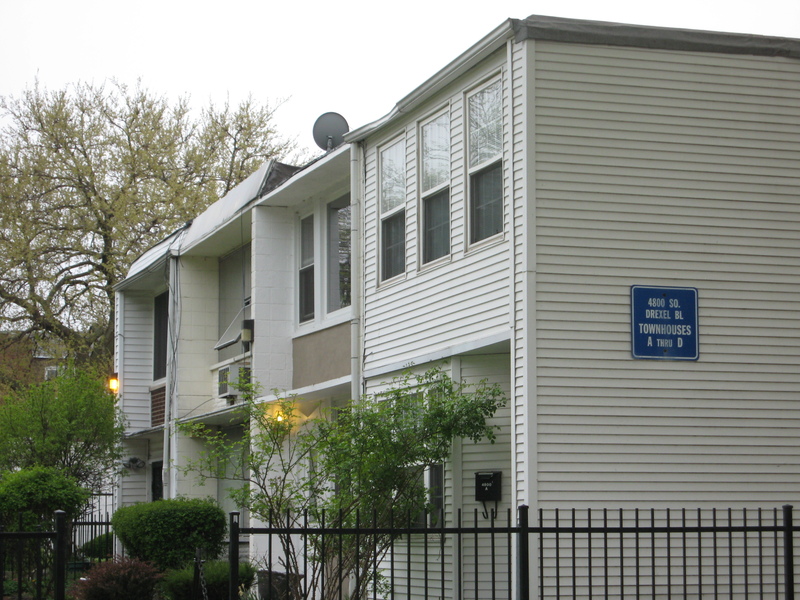 Raymond Hilliard Homes, Chinatown (1966): On an irregular site along busy Cermak Road, this is one of the most successful of Chicago’s public housing complexes. Although access to the site is limited, this is Goldberg at his curvaceous, precast best. His signature rounded forms are on clear display here. 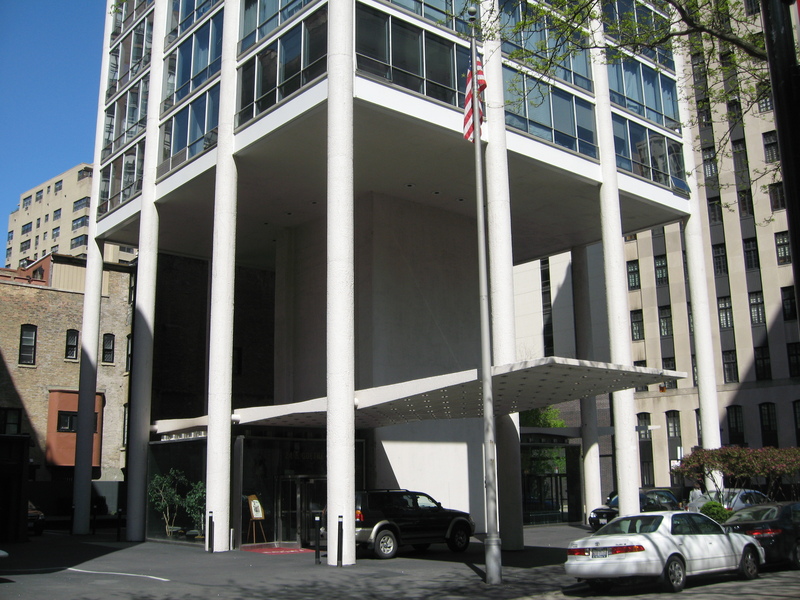 For an architect of his influence, this is apparently the only Goldberg structure on the National Register of Historic Places. River City, South Loop (1986): The building extends over the water, and instead of the parking garage in Marina City, here it’s replaced by boat slips. The form is complex and difficult to grasp from street level, and it’s in a lousy location, cut off by Congress Parkway, and out of the urban fabric, with vacant lots to the north and south. It’s best seen from across the river, or from the architecture boat tour, or if you’re lucky, from a plane, where the S curve of the layout becomes clear. Marina City, River North (1967): This is his best-known project, with corncob floors rising out of a spiraling garage base. It’s part of an ensemble of architectural heavyweights, with Mies’ landmark IBM building next door, and along Chicago’s architectural textbook Dearborn Street. Mies was not the only style in Chicago in the mid-20th century. The construction of the towers was an event, with the slim concrete core of the structure rising to its full height as the first stage of construction. Whole books have been written on these structures, so I’ll just post a pretty picture. 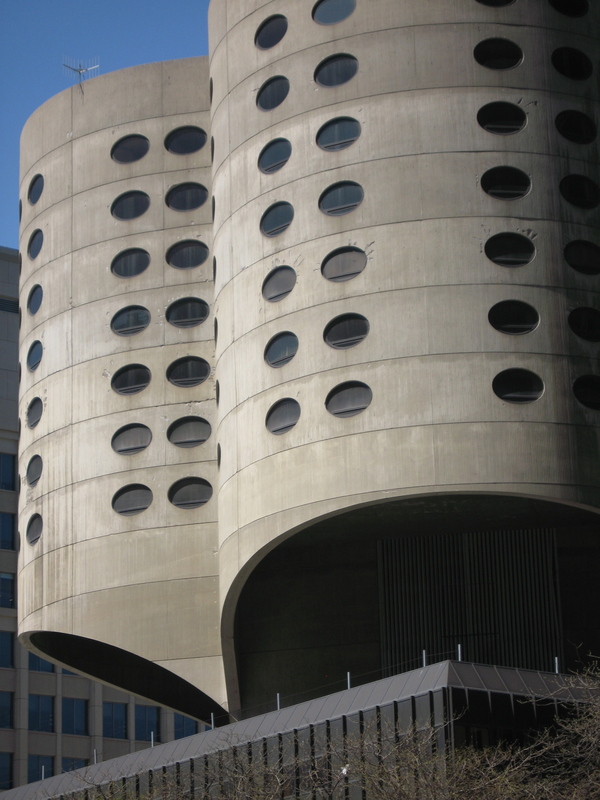 Prentice Women’s Hospital, Streeterville (1975): On borrowed time, it looks like it’s destined for demolition, and is now one of the nation’s most endangered landmarks. It’s been empty since 2007, and the building next door to it has been demolished, now affording a clear view of the structure. At ground level, it’s rather grim, with ill-defined entrances, but really shines above ground, with the soaring cloverleaf structure growing out of the base. The form is unmistakable, unique and innovative even for Chicago, a thrilling piece of engineering and architecture up top, but marred by an additional floor on the base that hides a clear view of the extraordinary cantilevering. For more information on the building and the detailed reuse study, see the Landmarks Illinois and the National Trust page on Prentice. Prentice Women’s Hospital, better visit now before it’s gone! Astor Tower, Gold Coast (1963): Using the rounded columns of his Helstein House, Goldberg gave us a tower in the formerly low-rise Gold Coast district, but with a small and distinct footprint at street level. The base is small, with two canopies at the asymmetric entrances. Signature 1960s chic and glamor that feels its age. The windows used to be louvered, but those were replaced in a recent renovation with more pedestrian glass elements. Brennemann Elementary School, Lakeview (1963): Very little of the Goldberg structure is visible, it’s been virtually obliterated by more recent building. Wright College, Montrose at Narrangansett (1992): On the very edge of Chicago, this is his last completed work. I didn’t have the chance to look closely at this, but it’s unmistakably his work, with its rounded forms and windows. Definitely worth a closer look next time I’m in town.